Q. 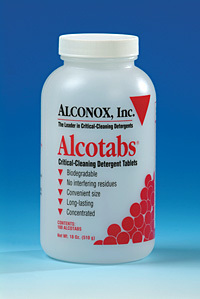 Does Alconox have any information on using conductivity testing for residues of Alcotabs detergent? A. Yes, if you are performing conductivity testing for Alcotabs detergent, please adapt the procedure to use a conductivity meter and deionized water that is sensitive to ionic detergent residue. You should test approximately 1% of large frequently washed quantities of glassware and 5% of smaller quantities of less frequently washed glassware, and you should rotate the types of glassware tested. Particularly try to test narrow necked volumetric flasks more frequently. Keep records of the test date, types of glassware tested and test results. To read more about the procedure, visit Residue Detection Methods. To request a free sample of an Alconox brand detergent please visit Get Sample. To ask our experts another cleaning question please visit Ask Alconox. ← What is a TOC Residue Detection Method?